We have the first shots of the 2009 Ford F-150 and, if you're a "Ford Truck Man" you'll certainly enjoy them. And if not, with 35 variations ranging from the entry level XL to the pre-pimped luxo Platinum Edition if you can't find one you like you're just not trying hard enough. Live shots below and the in-person experience confirms the "I am Daveness" of the 2009 Ford F-150's grille, as previously seen. The vision for Ford's truck team was clear: Redesign America's favorite truck inside and out to give customers unrivaled capability, unprecedented choice and a host of smart, game-changing features. The result is the new 2009 Ford F-150, the new benchmark in the full-size pickup segment from the industry's truck leader - which has built more than 33 million F-Series pickups since 1948. The Ford truck team adopted a holistic, 360-degree approach to revamping the new 2009 F-150 - from its segment-first features to the tough new exterior highlighted by a dramatic three-bar grille and more spacious, flexible and refined interior, to the unparalleled choice of cab styles and trim levels - including a new Platinum series that redefines truck luxury. The improvements are just as dramatic beneath the sheet metal. A new high-strength, lighter-weight chassis is the backbone that allows this tough truck to deliver more horsepower, better fuel economy and safety, and additional towing and payload capacity. "The Ford F-150 is an American icon," said Mark Fields, Ford's president of The Americas. "Ford is the truck leader, and F-150 customers expect and demand the best truck on the market. "Our team not only met those expectations, they exceeded them with the new 2009 F-150," Fields added. "With Ford's product-led transformation in full swing, the new F-150 could not have come at a better time - for Ford and for our customers." In all, more than 1,000 Ford engineers, designer, researchers and others worked together to develop the new 2009 F-150. The team drew inspiration by listening to Ford's large customer base. "Before we started working on the new truck, we continued the conversation with people who use these trucks every day for work and play," said Matt O'Leary, chief engineer of the 2009 F-150. "We went to their ranches, their job sites and their homes, making sure we crafted features that would improve their ownership experiences and, really, their lives." The results will be clear to customers when the new 2009 F-150 rolls off assembly lines at Ford's Dearborn (Mich.) Truck Plant and Kansas City Assembly Plant in Claycomo, Mo - and as the new F-150 goes on sale in dealer showrooms this fall. Ford F-150 customers tackle tough jobs when they work and play, and they need a full-size truck that rises to the challenge. The current F-150 is already the most capable truck on the market, but Ford's truck team drove capability to new levels with the 2009 model. The improvement starts with the 2009 F-150's fully boxed frame constructed with hydro-formed and high strength steel side rails. The lightweight frame delivers 10 percent more torsional rigidity, which delivers increased durability and safety. The sturdy chassis also paved the way for the new 2009 F-150 to improve upon the current model's class-leading towing and hauling capability across all cab configurations. "The new, improved chassis helps deliver additional payload and towing capacity as well as improved fuel economy, which we know is top of mind for customers," O'Leary said. Thanks to the strength of the frame and comprehensive package of standard safety equipment, including side-curtain air bags, the new F-150 is engineered to earn top safety ratings from the National Highway Transportation Safety Administration and the Insurance Institute for Highway Safety. Complementing the modern frame is a high-tech suite of features that ensures the F-150 is sure-footed and safe in all driving and load conditions. The new F-150 offers segment-first standard AdvanceTrac® with RSC® (Roll Stability Control) and Trailer Sway Control plus available Rearview Camera Assist as well as Integrated Trailer Brake Controller a segment-first on light-duty pickups. The interior of the new 2009 F-150 SuperCrew offers more usable space for moving more people and gear thanks to a 6-inch stretch that improves rear seat legroom and cargo capacity. A mechanically articulated second-row seat flips up and out of the way. Combined with a truly flat load floor, the feature gives the new SuperCrew class leading 57.6 cubic feet of space behind the front seats and can accommodate items up to 47.9 inches tall, such as flat-screen TV that needs to be hauled from the electronics store to home. Ford's F-Series may be America's best-selling vehicle, but one-size-fits-all does not apply to today's truck buyer. From the Texas rancher to the general contractor in Florida, F-150 customers have different needs and tastes. In response, Ford's truck team designed a truck that offers more choice than any full-size truck on the market. With three cab styles, four box options and seven unique trim levels, the F-150 comes in 35 different configurations to meet the widest range of customer needs and wants - all delivered with quality. Customers can choose from the no-fuss XL workhorse, to the sporty STX and off-road capable FX4, to the mid-range XLT. For those looking for tough luxury, Ford offers the high-end Lariat and King Ranch F-150 models. New for the 2009 F-150 is the Platinum series, the most luxurious F-150 ever and the answer to a perennial question: Just how high-end do truck customers want to go? The striking F-150 Platinum features a satin chrome grille with fine mesh inserts, 10-way captain's chairs upholstered with top-quality leather, tuxedo stitching and embroidered logos on the seatbacks. Satin gloss Lacrosse Ash wood grain accents and real brushed aluminum panels give the dash, center console and doors an upscale look and feel. Standard 20-inch, 16-spoke polished aluminum wheels give the truck a commanding presence on the road. With more customers interested in personalizing their trucks, Ford is offering the largest selection of wheels in the segment with 13 offerings across the F-150 lineup. • 5.4-liter, 3-valve Triton V-8, which has been optimized for better performance with improved horsepower and torque and is capable of running on E85 (85 percent ethanol and 15 percent gasoline), pure gasoline or any blend in between. • 4.6-liter, 3-valve V-8, which is new for F-150. Both the 5.4-liter and 4.6-liter 3-valve V-8's utilize open valve injection. This unique feature improves the flow of fuel into the combustion chamber, which results in an increase in horsepower during towing and reduced emissions. • 4.6-liter, 2-valve V-8, a third V-8 choice in the line-up that delivers more horsepower with the same fuel economy performance as the outgoing truck's V-6. This all-V-8 engine lineup delivers a fleet-average 1 mpg improvement in fuel economy versus the outgoing F-Series. 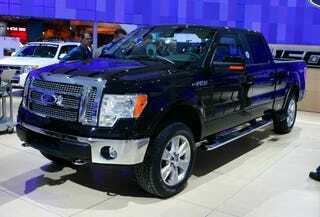 Diesel and EcoBoost gas turbo direct injection engines are planned for F-150 in 2010 as well. Ford's researchers spent thousands of hours listening to truck buyers to gain inspiration for a host of the smart new features for the new 2009 Ford F-150. It starts with the clever interior, which features a flow-through console that's been lengthened by approximately 2 inches and is large enough to stow two or more laptop computers. Special ridges are molded into the edges of the bin to accommodate file folders. The console also has a multi-tiered, removable tray and locks to protect valuables. More than 30 storage areas are built into the interior, ranging from a bin on the top of the instrument panel to a number of small spaces designed to accommodate tools like cell phones, MP3 players, PDAs and gate access cards. A redesigned, more ergonomic shifter remains on the console. New, larger buttons and switches are ergonomically designed and within easy reach and view of the driver. A USB port and auxiliary MP3 player input are conveniently mounted on the dash. Two 12-volt outlets are located on the dash and center console. Even the pickup box on the new F-150 breaks the mold with clever and capable features the competition cannot match. The class-leading cargo capacity of 65.5 cubic feet is only the beginning of the story. The F-150's pickup box is made easier to use, more flexible and accessible with such new features as Ford's industry-exclusive Tailgate and Box Side Steps, Stowable Bed Extender and Cargo Management System. "These features are impressive on their own. For the customer who uses their pickup box five, six or seven times a day, these innovations together make a huge difference," O'Leary said. That same kind of logic drove the team to include other clever features on the truck, including Ford's Easy Fuel™ Capless Fuel-Filler System. When fueling is completed and the nozzle is removed, the system automatically seals shut, reducing emissions. • Industry-exclusive Ford SYNC™, a voice-activated, hands-free, in-vehicle communications and entertainment system offers even more functionality for the 2009 model year, with 911 Assist and Vehicle Health Report. • SIRIUS Travel Link™ that when combined with voice activated navigation will provide users with a suite of data services including real-time traffic, coast-to-coast weather conditions and fuel price information for over 120,000 gas stations. • Voice-activated navigation that integrates several functions, including voice recognition destination entry, climate control and SIRIUS satellite radio into one easy-to-use system, displaying them on an 8-inch touch screen display. • Sony audio system features 700 watts of power, 5.1 surround sound and 10 Sony speakers and amps and is certified by Sony to deliver a unique, rich listening experience. "We know how important the F-150 is to our customers," said O'Leary. "With the new 2009 F-150, we are delivering a top-quality truck lineup that is second-to-none in capability, features and a range of choices that will continue to make Ford America's favorite truck."